People of all faiths and all walks of life are always welcome at St. Angela's. There are many ways to become involved in our Church even if you are not yet Catholic. If you are interested in becoming Catholic we encourage you to visit our Becoming Catholic page to learn more. If you are interested in joining St. Angela's complete the Parish Registration form and either email it or return it to the Parish Center. 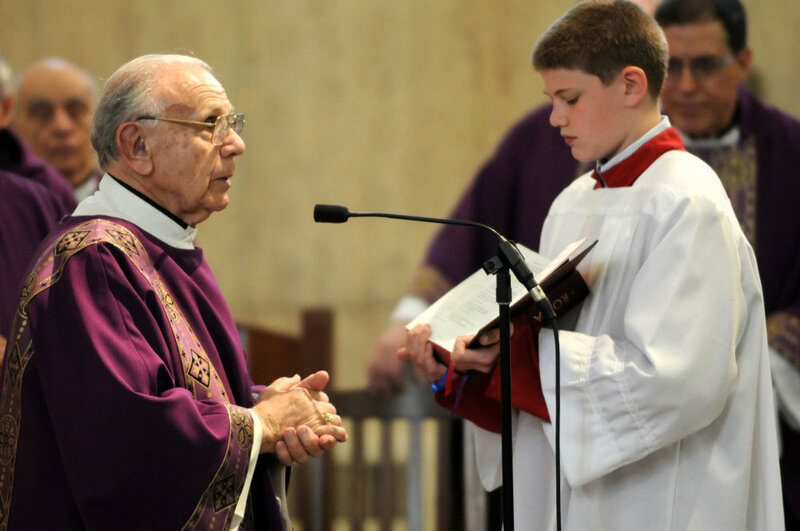 Wednesday, March 20 Diocesan-Wide Evening of Confession - 5:00-8:00 p.m.
Read Father Lanning’s Easter Letter to the Parish. Tuesday, April 16 Taizé Prayer Service - 7:00 p.m.
Good Friday, April 19 Our Lord’s Passion - 3:00 p.m. Stations of the Cross (without Benediction) - 7:00 p.m.
Holy Saturday, April 20 Blessing of Food - 12:00 p.m. Confessions - 1:00 - 2:00 p.m. Easter Vigil Mass - 7:30 p.m.
Easter Sunday, April 21 Mass Times - 7:30 a.m., 9:30 a.m. (simultaneous Mass in Rini center/Gym), 11:30 a.m. & 12:45 p.m.
Holy Days: Vigil 5:30 p.m., 6:30 a.m., 8:30 a.m., 12:00 p.m., 7:00 p.m.
Reconciliation Schedule - Saturday: 3:00 p.m.-4:00 p.m. 1.) Bakery: We need 15-20 people to bake 3-4 dozen cookies, cupcakes, or brownies, cut into individual serving size. Bakery can be dropped off at St. Angela Parish Center on Friday, April 26. 2.) Volunteers: We need people to come to St. Colman to assist with serving and cleaning up dinner on Saturday, April 27 from 3-5 pm. 3.) Donations of Raffle Prizes: There is a free raffle for the people we serve during the meal. Please consider creating a raffle bag or basket, decorated or plain, with a donation of breakfast pantry supplies like shelf-stable pancake mix and syrup or almonds and raisins, toiletries or cleaning supplies like soap and razors or Lysol and Kleenex, or gift cards (Dave’s, Sav-A-Lot, Walgreens, Target). Bus passes are always appreciated. Please drop at the Parish Center by Friday, April 26. Join us for Bible stories, games, crafts and more! Through CRS Rice Bowls, we show our faith in action in our own community and in over 100 countries throughout the world. Please pick up a Rice Bowl from the vestibule and use the Lenten calendar insert to engage daily with the spiritual pillars of Lent: Prayer, Fasting, and Almsgiving. Place your Lenten sacrifice – coins, cash, or check – in the Rice Bowl and drop them off in the bins in the vestibules the weekend after Easter, April 27th and 28th. St. Angela’s day school has openings for students in K - 8th grade for the 2019-2020 school year. A ministry of our parish, St. Angela Merici provides a catholic faith-based education with a personal approach. Our unique learning model of lower school (K-4) and upper school (5-8) positions students to enjoy a well-rounded, academically rigorous experience with special emphasis on faith formation, community and leadership. In addition to core competencies, St. Angela’s curriculum incorporates religious instruction, languages, technology, art and music. With preparation for high school, and beyond, St. Angela Merici School is educating tomorrow’s Catholic leaders. Call (440) 333-3126 to learn more or to schedule a tour of our campus, or visit Gradelink to enroll. Walk in Faith. Give in Joy. Your support of the 2019 Catholic Charities Annual Appeal helps us to all become missionary disciples. Please consider a generous gift that will change the lives of people like David, Marian, Shaye and Sharita. Hear their stories of transformation at www.catholiccommunity.org/videos. On behalf of the poor and needy of Northeast Ohio, thank you for your commitment to make a difference in the lives of those less fortunate. Check out SAM in the News!